Brands don’t live forever. Commercial death occurs when the last bottle comes off the production line, and psychosensory rigor mortis sets in with the last spray from the last bottle. An extinct fragrance can trigger no memories for anyone. To preserve memory we must preserve the juice itself. How will we know what we’re missing when it’s not there to smell? This inspired me to discuss Andy Warhol’s idea of a Perfume Museum, a concept with some merit but that poorly executed could prove to be a testosterone-draining experience for most men. To compensate I suggested the museum include a hormone-stabilizing Hall of Olfactory Technology, featuring the first atomizer—invented in 1859 for purposes other than perfume application—and how it inspired Wilhelm Maybach’s design of the carburetor and led to Robert Millikan’s Nobel Prize for Physics in 1923. Now, thanks to Perfumaniac, the nom de web of a New Orleans-based blogger who writes at Yesterday’s Perfume, I’ve got another potential exhibit for the Hall of O.T. 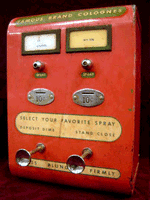 The Perfumatic was typically mounted on a restroom wall; it came in two- and four-column models. The company, based in Canada, had over four hundred units installed in the United States by 1952. 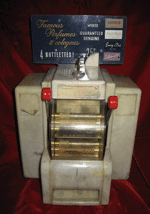 The local distributor was Jo-Lo Perfumatic, based in Jersey City, New Jersey. 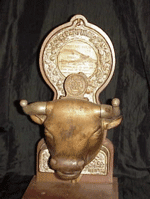 Further back we find the One Cent Bull Perfume Dispenser by the Continental Novelty Co. of Buffalo, New York. You insert your penny, pull down on the bull’s horns, and get a squirt of scent from his mouth. 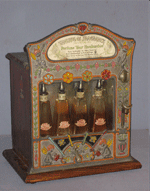 This device—“Whiffs of Fragrance”—allows you to “Perfume Your Handkerchief” after selecting one of the four bottles, inserting a coin, and pulling down on the lever. The technology has come a long way in some respects (remember the Robo-Spritzer?) but the basic idea remains the same. Dr G have you ever been to the Museum of Jurassic Technology, in Los Angeles? Very odd and worth a trip. I remember seeing those perfume dispensers here and there. Oh, Della! That would be . . . I can't even think of a word that conveys the bouncing up and down excitement I feel when thinking of a newly designed machine like one of the above. Thanks for pointing me to the Museum of Jurassic Technology. Their web site is quite bizarre--next time in LA I'm so there. P.S. My favorite $3 ticket in San Francisco is the Camera Obscura next to the Cliff House. Something hypnotically soothing about watching the entire outside world rotate slowly in a shallow bowl. 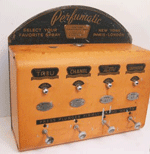 Perfumatics are retro classics of design--they're the Cadillac tailfins of perfume technology. Check out this photo. I vote with Nathan Branch: you should definitely do something along these lines!